It is typical of a slide in performance for the Boston Red Caps (now known as the Atlanta Braves) and it was true in 1880 as well. Lack of pitching. The Red Caps had a combined ERA 0f .308. It would sound good today but not then. Buffalo had .309 ERA. The top teams that year had ERA’s about a full run lower. That will end you up in sixth place for sure. Tommy Bond seemed to be running out of steam. 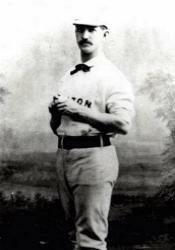 Harry Wright had him pitch in 63 games that season. He started 57 of those. He had a long four seasons with Boston. He averaged 61 games for those four years. He was wearing out. He still managed to win 26 games however. Sounds pretty good but not when you consider 15 less than he averaged the previous three seasons. He also lost 29 games in 1880 as well. So with a below .500 season they Braves ended up 27 games behind the leader.